Sitting here at my desk, I&apos;m trying to snap out of vacation mode. I was lucky enough to escape to sunny Fort Lauderdale, FL with my family all last week, and let me tell you, getting back in the swing of things is hard! Anyway, we had a blast, and one of the things we were able to do was head down to Key West for a day and tour the Ernest Hemmingway Home and Museum (Hemmingway is famous for several works including The Old Man and the Sea and A Farewell to Arms). I&apos;m an English major, so you can probably imagine my nerdy excitement! Touring the house and grounds was awesome, and as we were walking through I couldn&apos;t help but think of all the history back home in Rockford. You don&apos;t need to fly to Florida to catch a glimpse into the past. Rockford has its own rich history that&apos;s celebrated in many area attractions, and Midway Village Museum is one of these. Midway&apos;s website explains: "The Victorian Village is comprised of 26 historical buildings filled with artifacts of the era as well as several beautiful 19th century gardens that depict life in Northern Illinois from 1890 to 1910." Seasonally (May-August), interpreters dressed authentic to the Victorian era are available for guided tours through the museum grounds. Historical buildings represented include a General Store, Police Station, School House, Barber Shop and others (check out this post by Liz for a little further insight). Midway Village Museum also offers special events throughout the year. In fact, coming up in September (Saturday 9/21 and Sunday 9/22) is World War II Days -- the largest WWII era reenactment in the United States! Visitors are able to witness elaborate and realistic battles "complete with tanks, artillery, armored vehicles, and exciting pyrotechnic displays," according to the event page. Clearly, Midway Village Museum is a must-see, and it&apos;s right here in our own backyard. Keep in mind that you don&apos;t need to go far to experience a vibrant history. 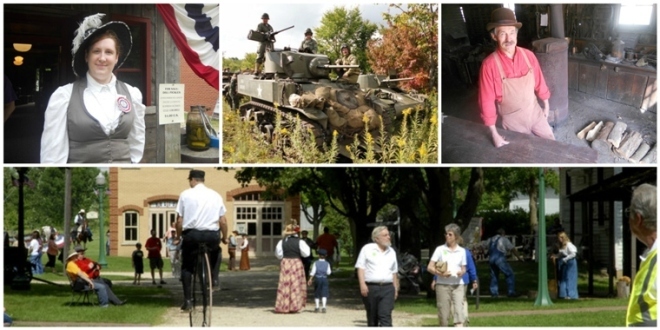 Midway Village Museum is just one of several historical sites that Rockford has to offer. Yes, Florida was awesome and it&apos;s wonderful to get away sometimes, but we have so much available in our own city! You&apos;d be remiss not to take advantage of it.